Pupils from Royton and Crompton School in Oldham were given the exciting opportunity to visit Oldham Coliseum, as part of Mosaic’s Secondary School Mentoring Programme. With 125 years of history, the Oldham Coliseum is one of the UK’s oldest producing theatres still in operation. The theatre creates everything from wigs to stage props; all in-house. Past performers at the Coliseum have included Charlie Chaplin, Minnie Driver and Ralph Fiennes. Students were treated to a behind-the-scenes tour of the building, exploring set designs and trying on a few eccentric costumes. Following this they were split into smaller teams and tasked with writing up job descriptions for the various departments in the theatre, discussing the benefits and challenges of each role and department. 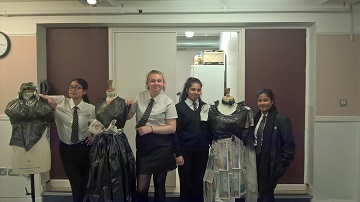 Students also had the chance to design their very own dame costume. Mosaic’s World of Work visits are an invaluable way for young people to gain insight into local workplaces. In the North West, employer hosts have included L’Oreal Paris, National Football Museum and One Advice Financial and Legal Services.